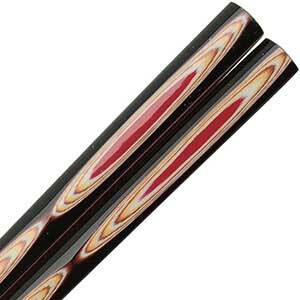 Here you'll find a collection of some of the best Japanese made chopsticks. Most of our Japanese Chopsticks are made in Obama, Japan, which produces 80% of all chopsticks manufactured in Japan following centuries of tradition and craftsmanship. Japanese chopsticks are typically about 9 inches long, gracefully tapering from handle to tip. In Japan they are called "Hashi" which means bridge. This category has many fine Japanese-made, authentic chopsticks not specific to a specialized craftsman style. Amazingly, Obama (yes, same name as our former President) is a small town of only 32,000 people. A century ago there were more than a hundred masters and their families making chopsticks. Today, there only about ten Japanese chopstick makers. 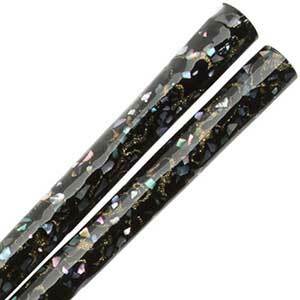 Elegant gloss black and dark wood chopsticks with iridescent owl, moon and stars. 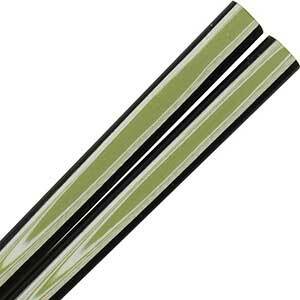 Chopsticks are 9 inches long with square handles and textured tips. Made in Japan. Charming little panda bear faces on a medium brown natural wood Japanese chopsticks. Smooth clear lacquer finish and smooth tips. 9-1/8 inches long. Made in Japan. 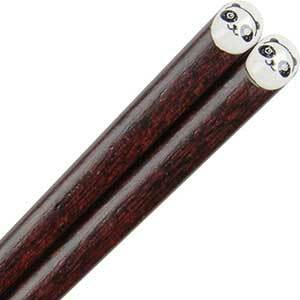 Cute black and white panda face at the end of satin finished dark wood chopsticks. Chopsticks are 9 inches long with textured tips and square profile. Made in Japan. 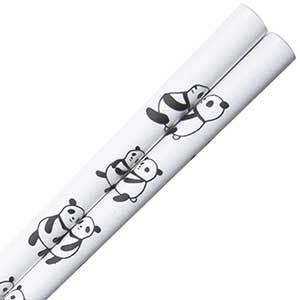 Cute pandas on chopsticks! Black pandas on a white background handle with black tips. These dishwasher safe Japanese made chopsticks have a satin finish, textured tips, blended profile and are 9-1/8 inches long. 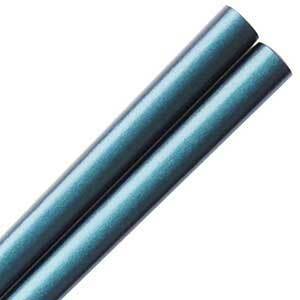 Beautiful and elegant blue pearlescent Japanese chopsticks. This pair of chopsticks is 9 inches long with textured tips and blended ends. Japanese made chopsticks. Beautiful and elegant cranberry pearlescent Japanese chopsticks. This pair of chopsticks is 9 inches long with textured tips and blended ends. Japanese made chopsticks. Beautiful and elegant green pearlescent Japanese chopsticks. 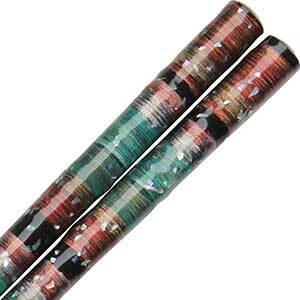 This pair of chopsticks is 9 inches long with textured tips and blended ends. Japanese made chopsticks. Beautiful and elegant purple pearlescent Japanese chopsticks. This pair of chopsticks is 9 inches long with smooth tips and blended ends. Japanese made chopsticks. Dishwasher safe clear plastic spiral Japanese chopsticks with smooth tips and round domed ends. These chopsticks are 9 inches long. Made in Japan.Limited stock on hand. Please inquire for large purchase. Dishwasher safe eco black plastic chopsticks of black plastic in a hex handle shape. Round textured tips for easy gripping of food. These Japanese style hexagon chopsticks are 9 inches long. Made in Japan. Looking for a higher volume? Checkout wholesalechopsticks.com for volume pricing. Dishwasher safe eco plastic Japanese chopsticks of blue plastic with a square scalloped handle. Square textured tips for easy gripping of food. These chopsticks are 9 inches long. Made in Japan.Looking for a higher volume? Checkout wholesalechopsticks.com for volume pricing. Dishwasher safe eco plastic Japanese chopsticks of red plastic in a hex handle shape. Round textured tips for easy gripping of food. These chopsticks are 9 inches long. Made in Japan.Looking for a higher volume? Checkout wholesalechopsticks.com for volume pricing. 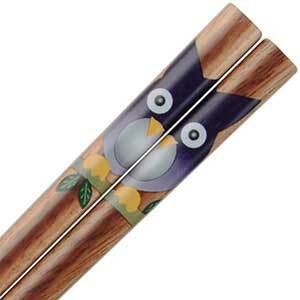 These fun chopsticks feature a purple owl on medium wood Japanese style chopsticks that are 8-7/8 inches long with a blended profile handle and textured tips for easy gripping of food. These are Japanese made chopsticks. 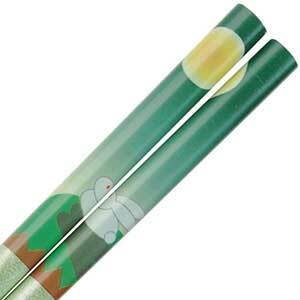 These fun and charming chopsticks have a design of a cute little rabbit sitting in a hill with the bright moon overhead. The chopsticks are finished in pearlescent light green. 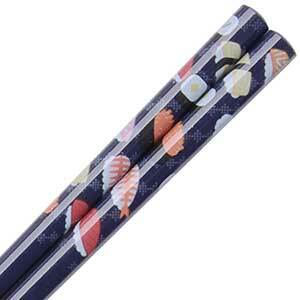 The Japanese style chopsticks have a blended shape with smooth tips and are 9 inches long. Japanese made chopsticks. 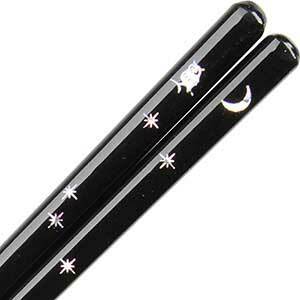 Satin finish white Japanese chopsticks with a delightful rabbits and moons on royal blue design. Blended profile handle. Textured round tips for easy gripping of food. These chopsticks are 9 inches long. Made in Japan. 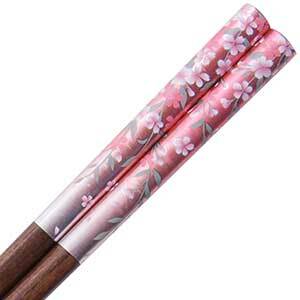 Beautiful sakura (cherry blossoms) on a pink and silver metallic background, on natural wood chopsticks. These Japanese-made chopsticks are 8-7/8 inches long with a textured tip. 1 pair of chopsticks. 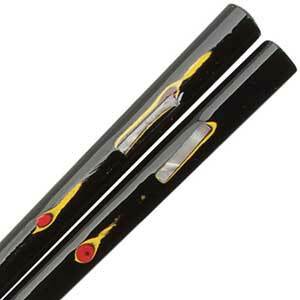 Black glossy chopsticks accented with red and gold lacquered under layers and embedded with shell. 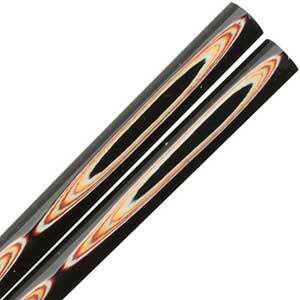 These chopsticks are 9 inches long with a blended profile handle and smooth tips. Japanese made chopsticks. Japanese style chopstick. 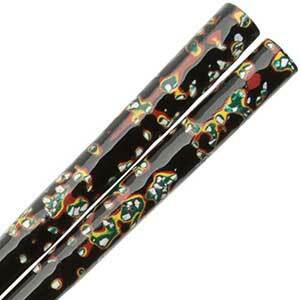 Gold line through shimmering design on gloss black chopsticks reminiscent of a starry night. Dishwasher safe! Chopsticks are 9.25 inches long, have a textured tip and are made in Japan. 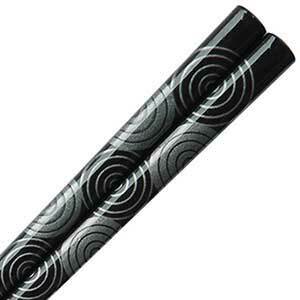 Silver circle design on gloss black chopsticks. Dishwasher safe! Chopsticks are 9.25 inches long, with smooth tips and are made in Japan. 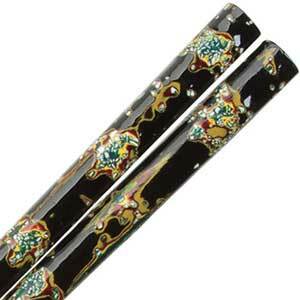 Ornate design of a gold sky dragon on matte black chopsticks. Dishwasher safe! These silver and black chopsticks are 9.25 inches long, have a textured tip and are made in Japan. 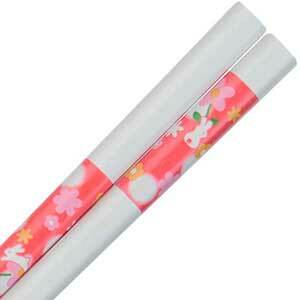 Because of the Japanese-style dragon chopsticks' extra length these will not fit chopstick boxes or webbing sleeves. 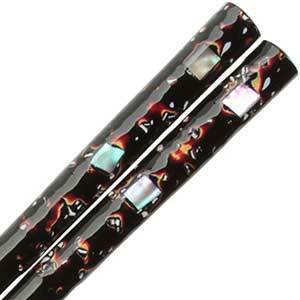 Beautiful and elegant silver pearlescent Japanese chopsticks. This pair of chopsticks is 9 inches long with textured tips and blended ends. Japanese made chopsticks. 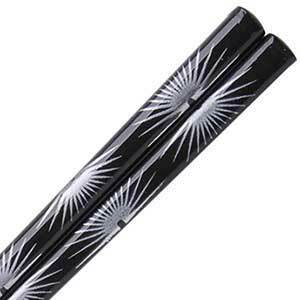 Silver starburst design on gloss black chopsticks. Dishwasher safe! 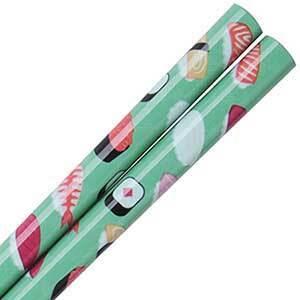 Chopsticks are 9.25 inches long, with smooth tips and are made in Japan. Elegant square profile dark wood chopsticks with satin deep red color handle. 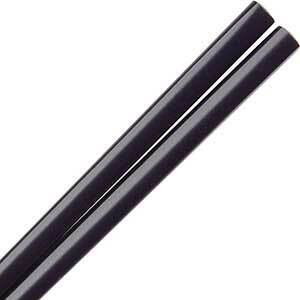 These slender chopsticks taper from 6 mm at the handle to just over 1 mm at the tip, while a typical Japanese chopsticks taper from 8 mm down to 2 mm. Smooth square tips. Made in Japan. 9 inches long and packaged in a gift box. One pair of chopsticks. Elegant square profile dark wood chopsticks with satin navy blue color handle. These slender chopsticks taper from 6 mm at the handle to just over 1 mm at the tip, while a typical Japanese chopsticks taper from 8 mm down to 2 mm. Smooth square tips. Made in Japan. 9 inches long and packaged in a gift box. One pair of chopsticks. Stately square profile dark wood chopsticks with satin purple color handle. These lithe chopsticks taper from 6 mm at the handle to just over 1 mm at the tip, while a common Japanese chopsticks taper from 8 mm down to 2 mm. Smooth square tips. Made in Japan. 9 inches long and packaged in a gift box. One pair of chopsticks. One pair of chopsticks. 9 inches long, packaged in a nice gif box. Elegant square profile dark wood chopsticks with red color handle. Slender chopsticks taper from 6 mm at the handle to just over 1 mm at the tip. A typical Japanese chopstick tapers from 8 mm down to 2 mm. Smooth square tips. Made in Japan. Elegant square profile dark wood chopsticks with satin ivory color handle. These slender chopsticks taper from 6 mm at the handle to just over 1 mm at the tip, while a typical Japanese chopsticks taper from 8 mm down to 2 mm. Smooth square tips. Made in Japan. 9 inches long and packaged in a gift box. One pair of chopsticks. Square profile dark wood chopsticks with satin yellow color handle. Elegant slender chopsticks taper from 6 mm at the handle to just over 1 mm at the tip. Typical Japanese chopsticks taper from 8 mm down to 2 mm. Square smooth tips. Made in Japan. 9 inches long and packaged in a gift box. One pair of chopsticks. 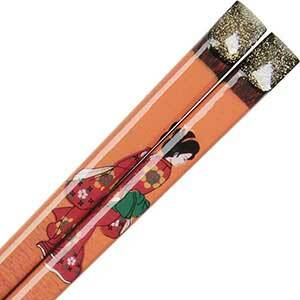 Dark brown wood chopsticks showing a Geisha in summer on an orange to deep red gradient background. Very fine quality chopsticks with square handles and textured tips. 9 inches long and made in Japan. Variety of sushi pictured atop blue chopsticks. Smooth tips with blended ends. Chopsticks are 9 inches long. Made in Japan. Variety of sushi pictured atop green chopsticks. Smooth tips with blended ends. Chopsticks are 9 inches long. Made in Japan.